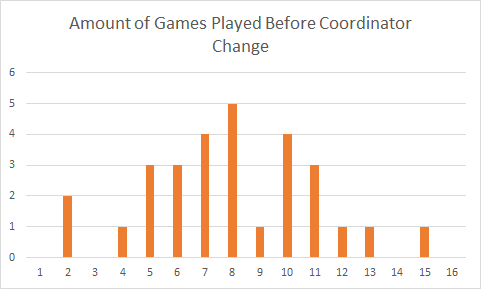 In our last piece, we discussed the increasing tendency of NFL teams to make in-season coordinator changes; this tendency has been entirely driven by a recent trend of changing offensive coordinators in the middle of the season. Today we’ll look at the ultimate outcomes of making such a change: team performance. Once again, we examined all in-season coordinator changes since the 2008 season. The distinct majority of such coordinator changes happen in the middle of season, between weeks 5-11. These changes often happen heading into the team’s bye-week, likely in order to give the new coordinator as much time to prepare as possible. The timings of these in-season changes seem fairly straightforward: the beginning of the season has not gone as planned, and teams make a change at coordinator to attempt to save the season. Perhaps surprisingly, though we noted teams’ increasingly itchy trigger fingers when it comes to replacing coordinators mid-season, the teams that have made a coordinator change have performed at a consistent (and poor) level. Better performing teams have not consistently made mid-season coordinator changes. Not only are bad teams becoming more likely to move on from poor performing coordinators mid-season, but those changes have been consistently correct. The team ends the season with a higher winning percentage than it had when it changed coordinators. 17 out of 25 teams which made such a change ended the season with a better win percentage, going from an average 30% winning percentage to 37%. This equates to an extra win over the course of a season. In our last piece, we noted that teams had become especially apt to change offensive coordinators over the past four seasons. The majority of these midseason offensive coordinator changes over the past four seasons (10 out of 16 occurrences, 63% correct) have yielded positive results for the team making the change. Even at an increased rate relative to the previous seven seasons, these decisions have continued to yield positive results. From our past two examinations into midseason coordinator changes, we can draw several conclusions. Poorly performing teams are less likely to wait until the end of the season to make a coordinator change, especially on the offensive side of the ball. 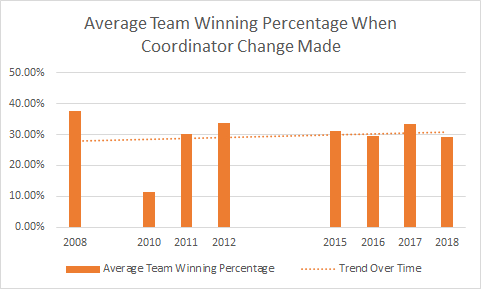 These changes often lend positive results for the team making the coordinator change, yielding increased end-of-year winning percentages. We began this miniseries into coordinator changes with the example of the Jacksonville Jaguars, who fired offensive coordinator Nathaniel Hackett and benched unpopular starting Quarterback Blake Bortles at the same time. Our findings suggest that perhaps other underperforming teams should take note of this decision. Rather than remaining loyal to the status quo in hopes of the team turning around on its own, a shakeup in decision making may lead to positive results.